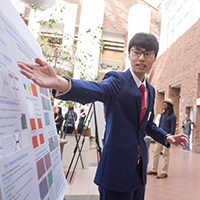 For the 13th year, students enrolled in "Perspectives In Global Health" are raising awareness and proposing solutions for today's global crises. 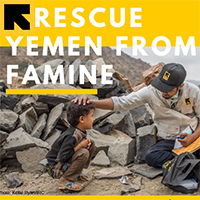 This year's focus is on the humanitarian crisis in Yemen. In her third season at IWU, Head Softball Coach Tiffany Prager got her 100th career win as the Titans took both ends of a doubleheader at North Park University at Holmgren Field in Chicago on Friday, April 19. The team then won 2 more on Saturday, April 20 against Elmhurst at the IWU Softball Field. 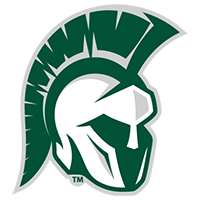 The Illinois Wesleyan men's golf teams finished in first and second place at the 19-team Millikin University "Take Back the Night Challenge" at South Side Country Club in Decatur. Former Illinois Wesleyan University football player and former trustee Deon Hornsby '97 greeted Chicago Bears head coach Matt Nagy at the American Red Cross Evening of Stars in Uptown Normal. Vandana Shiva, a noted environmentalist who was the Stevenson Lecture Series speaker at Illinois Wesleyan and Illinois State universities, urges conversion to organic farming. Also featured in The Pantagraph. Want your event listed on the University Events Calendar? Submit the information using our online form. 6 p.m., Young Main Lounge, Memorial Center – Earth Day Banquet – Students are invited to the inaugural Earth Day Banquet, sponsored by the Student Senate Sustainability Committee. There will be free vegetarian and vegan food, a speech by EPA hazardous waste inspector and civil enforcement officer Brenda Whitney, and raffles for environmentally friendly prizes. 11 a.m.-12:30 p.m., Eckley Quadrangle – Famine and Feast Games for Yemen – Themed activities will include an obstacle course, trivia and more. A $3 donation will enter participants into a raffle for a variety of prizes. 4 p.m., IWU Softball Field – Softball vs. North Central College – Live streaming video at www.iwu.edu/livesports. 6 p.m., IWU Softball Field – Softball vs. North Central College – Live streaming video at www.iwu.edu/livesports. 3 p.m., Horenberger Field – Baseball vs. Augustana – Live streaming video at www.iwu.edu/livesports. 7:30 p.m., Tucci Stadium – Men's Lacrosse vs. Augustana – Live streaming video at www.iwu.edu/livesports. 11 p.m.-2 a.m. (also Thursday, April 25), Dugout, Memorial Center – PB&J Extravaganza – Students are invited to come on over and make their own PB&J sandwiches, get some coffee, tea or cocoa, grab some fresh fruit and get a kindly word as they complete finals and finish the last projects of the semester. Sponsored by the Division of Student Affairs. 6 p.m., Horenberger Field – Baseball vs. Elmhurst College – Live streaming video at www.iwu.edu/livesports. 1 p.m., Tucci Stadium – Women's Lacrosse vs. University of Dubuque – Live streaming video at www.iwu.edu/livesports. B. Charles and Joyce Eichhorn Ames Professor of Physics Gabe Spalding gave an Invited Talk at the Optical Society of America (OSA) Biophotonics Congress, Tucson, Arizona, April 15-17, where he was chosen as the speaker at “A celebration of the Nobel Prize winning work of Arthur Ashkin.” Arthur Ashkin, who won the Nobel Prize this year, is the oldest person ever awarded the prize. Following a short set of remarks from Ashkin himself, Spalding, who has for 16 years chaired the largest conference in the field, delivered a speech outlining the legacy of Ashkin’s work, and the directions that subsequent work is now taking. 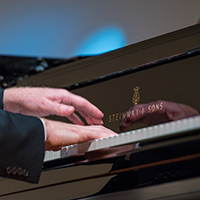 Fern Rosetta Sherff Professor of Music David Vayo attended the national conference of the Society of Composers, Inc. on March 29-30 at the University of New Mexico, where his composition Chambers was performed by the Boston-based ensemble Sound Icon. The conference was co-directed by Vayo's former student Peter Gilbert '96, who is on the faculty at UNM. Director of Conference Services Michelle Wu won the Association of Collegiate Conference and Events Directors-International (ACCED-I) Patrick Perfetto Volunteer of the Year Award at the ACCED-I annual conference on March 25. General reading book sale. Tons of books – $3 hardback, $2 paperback, 2 for $1 mass market paperbacks. Margaret "Maggie" Schnittker started April 15 as Assistant Director of Annual Giving in Advancement, replacing Carly Wilson '12. Subscribe to the Staff Forum (staforum) or Faculty Forum (facforum) listservs. 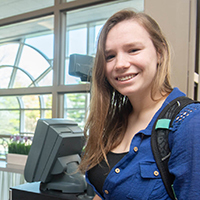 Campus Weekly is an electronic newsletter from Illinois Wesleyan's Office of Communications, edited by Ann Aubry, director of communications. To submit items of interest, email webedit@iwu.edu. See an archive of past editions.